You are browsing the archives of Chicken Tikka. Pizza Hut, Domino’s, Pappa John’s, Nirula’s… what do you seek when you crave a pizza? As a child growing up in the 1980s, pre-liberalisation India, I really loved what they served us at Nirula’s—stringy cheese pepperoni and ketchupy. There has been a sea change in the way we Indians eat now since then. 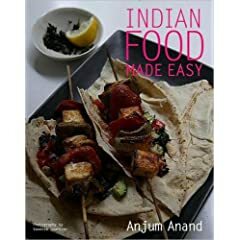 A presenter of BBC2’s Indian Food Made Easy, Anjum Anand is as attractive as some of the recipes photographed for this beautifully brought out book—with photographs by Vanessa Courtier. Anjum’s show was being aired on Discovery Travel and Living in India and the book was brought out alongside, or at least that’s how I laid my hands on it.